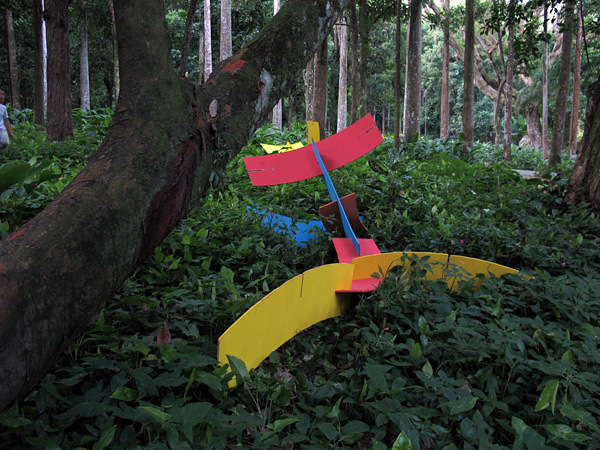 In april 2011, the artists El Tono and Momo were invited to participate in the event Nova Rio Contemporary Culture, organized in Rio de Janeiro by Rojo. They worked together to create some colorful sculptures at the Parque Lage. They decided to create something ephemeral and realized a modular wooden sculpture that could change its shape in an almost infinite range of possibilities. They model 23 pieces of wood that would be combined in different shapes and compositions. 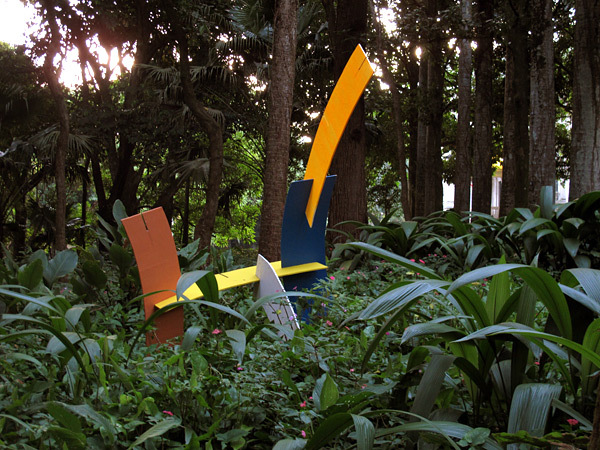 Then, after a week of work over the structure, they colored each piece and placed the sculptures through the park, in the middle of the jungle and its local fauna. 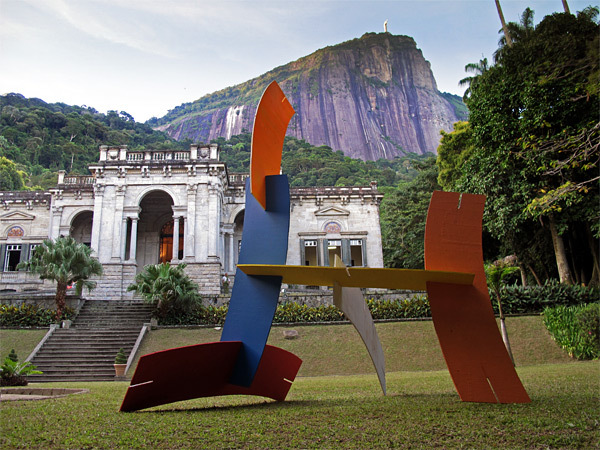 With their simple but provoking colorful structures, the artworks of El Tono and Momo have a familiar look to my eyes: they remind me some of Calder’s installations and sculptures. The sparkle of vivacity created from their works in the park is bright and attracting, and, although being non-natural elements, it seems like they were born in the park itself, together with trees and flowers. 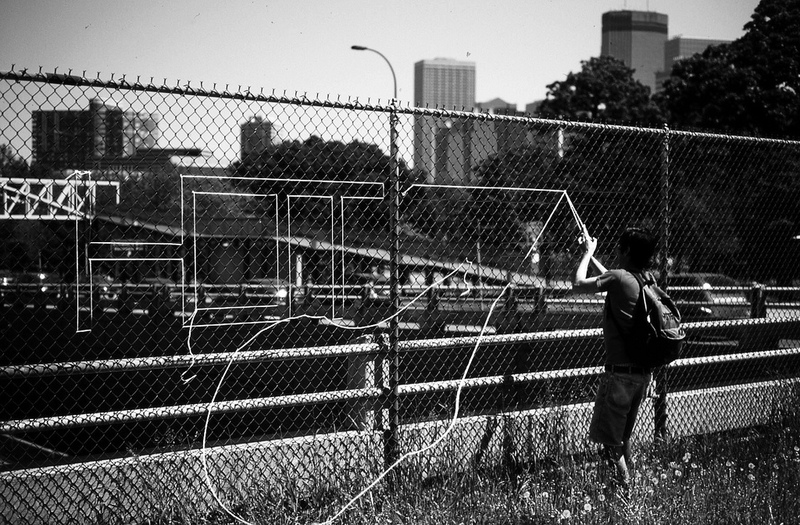 The New York Times recently published a list of the 41 things not to be missed during 2011. Between them there was also the new Museo del Novecento, in the very heart of Milan. So, some weeks ago, when we where traveling there, we decided to visit the museum, giving a chance to the world-renowned newspaper. During this visit, we had the chance to see a temporary exhibition, organized in a hall of the museum and dedicated to the relationship between art and urban environment In Italy from 1968 to 1976. 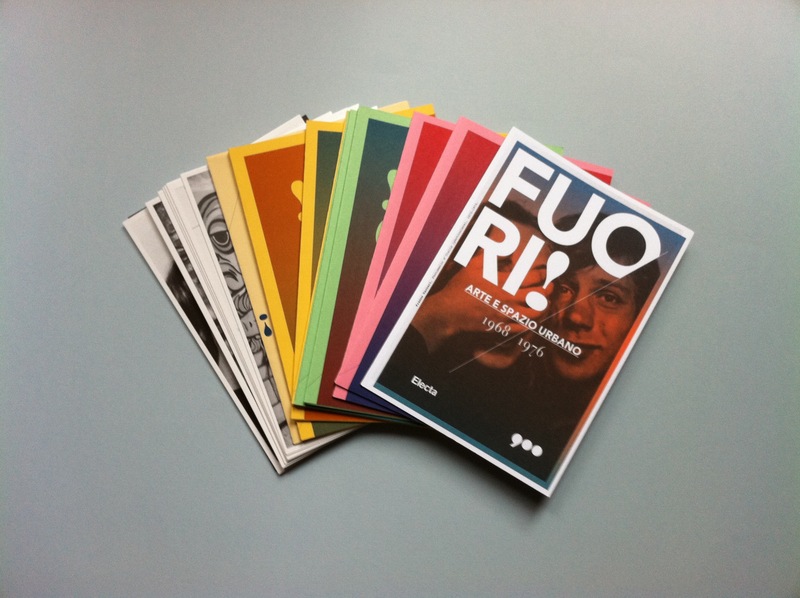 The exhibition is called FUORI! 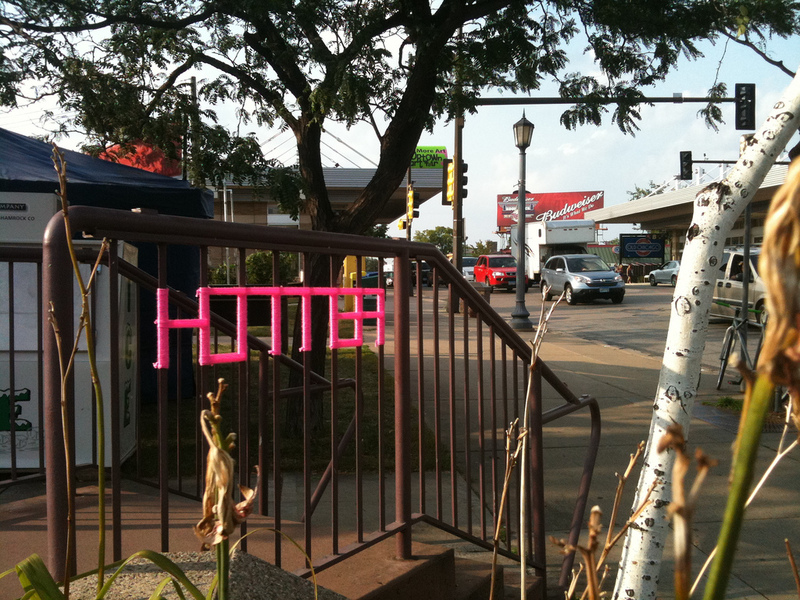 (Outside). 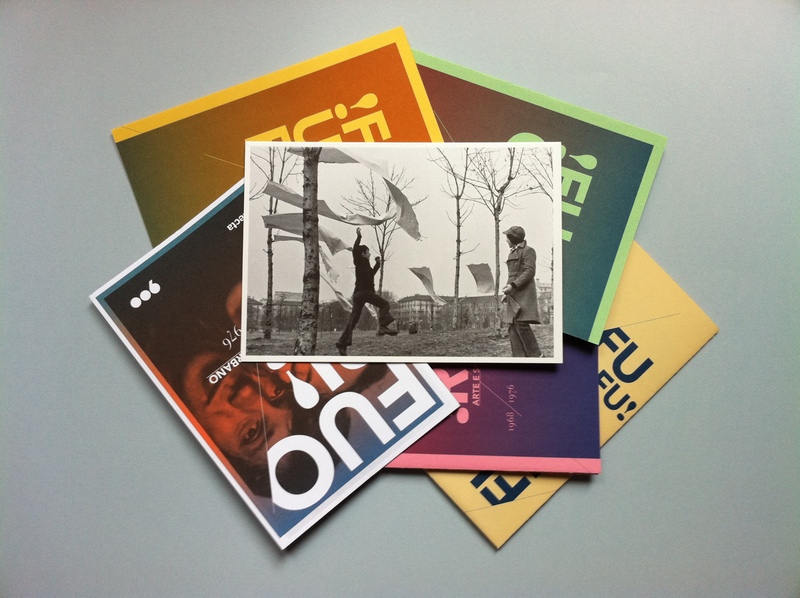 As the curators explain in the nice catalogue, around 1968 artists started to act outside galleries and museums, to face the real world and involve more and more people in their performances, installations and sculptures. While analyzing this movement, they especially focused on four historic events and exhibitions; in between them, Arte Povera + azioni povere, organized in 1968 in the old dockyard and in the streets of Amalfi, Campo Urbano, that took place in Como in 1969; Festival del Nouveau Réalisme, which happened the city of Milan in 1970, and Volterra 73 in the homonymous little town in tuscany during 1973. 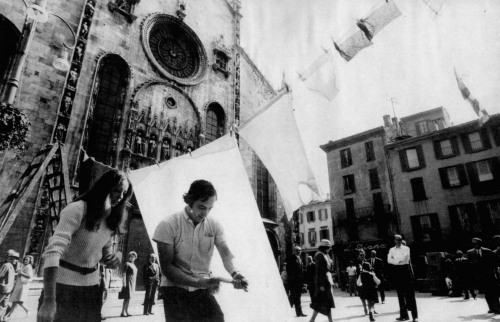 Even if these events where different between each other in the specific interventions they presented, they all had a common line based on ephemeral performances happening in the streets of the cities, a sort of first step towards that feeling of appropriation that characterized the following years and the early seventies. One of the main goal was to create a closer relationship between artists and citizens, as well as to encourage people to participate to the life of their cities, as it was demanded by the social and political atmosphere of that time. All of these events had basically an ephemeral soul, and that is why the exhibition prefers to tell this story with historical videos, pictures and slides. Visiting the exhibition, it was interesting to notice how what we are nowadays investigating has old and distant roots, also in our own country’s history. The Crack Garden is a hostile takeover of a concrete urban backyard by imposing a series of jackhammer “cracks.” Inspired by the tenacious plants that pioneer the tiny cracks of the urban landscape, the formal rows of this garden create order amongst the random and mixed planting of herbs, vegetables, strange flowers and rogue weeds. 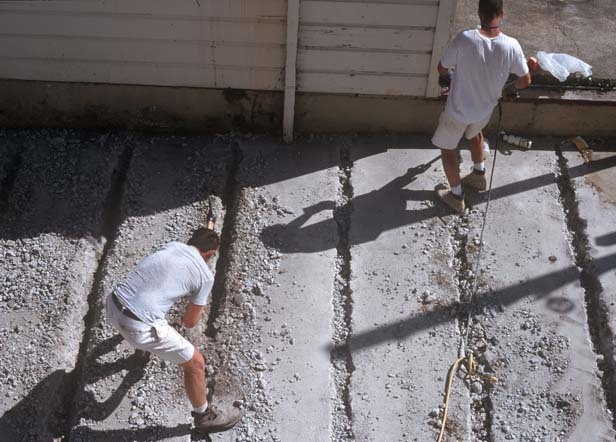 Crack Garden reminds us about two other similar interventions. The first one is the artwork Cut made by Franziska and Lois Weinberger in 1999. 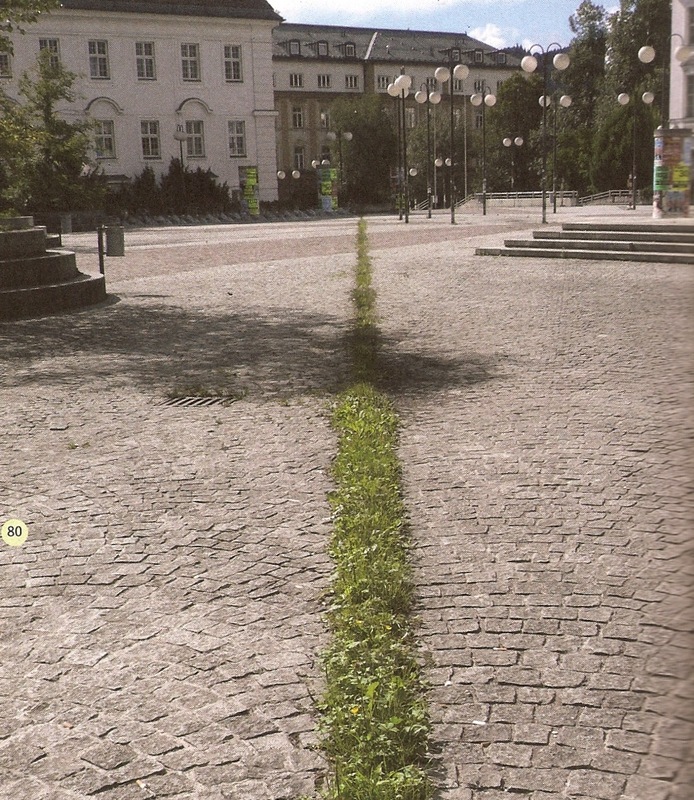 The project was realized in Innsbruck University square and consists in a “cut” that crosses all the square, thanks to a straight removal of the pavement, in order to create an interruption of the public space. Inside the cut, flowers and little plants were inserted. Along with time, the pattern became homogeneous with spontaneous green grown in the crack. As for Crack Garden, this artworks was inspired by all these plants that grow in the hidden corners and cracks of our city, the famous third landscape of Gilles Clément. 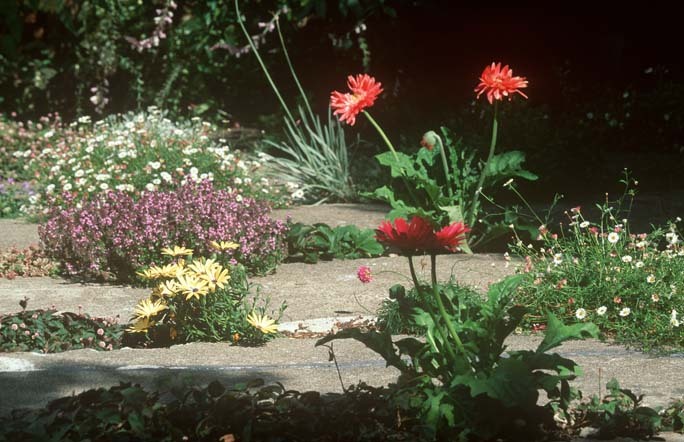 The second project we were thinking about is the one of Depave, a group of activists and citizens based in Portland which goal is to remove unnecessary asphalt in urban areas, in order to replace it with plants and flowers. They also recycle wrecked concrete to make up little enclosures where to plant different seeds. In lots of cities, the majority of ground surfaces is covered by streets or parking: Depave, through the removal of pieces of pavement, wants to re-establish natural environment, leading the way for green spaces in the city. After spending few days in jail for spray-painting graffiti on public walls, the street artist couple HOTTEA got redemption, and so decided to switch to knitting and started to do yarn-bombing actions around the city, changing paint for colorful threads. 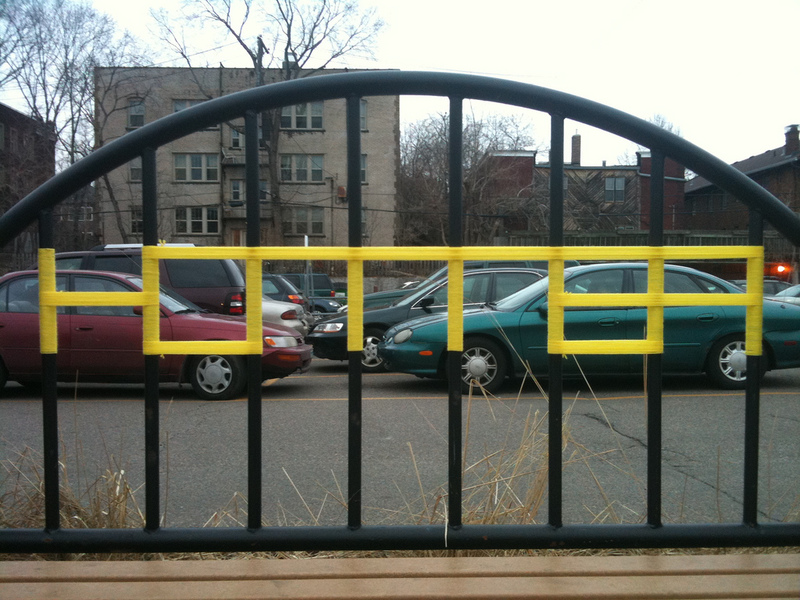 We love knitting in the streets, from the classic yarn bombing applied to street furniture and plants (Magda Sayeg, Janet Morton and many others) to other actions like the ones HOTTEA performs: it is a simple, silent, playful and reversible technique to hack the streets and add some color to our urban panorama. 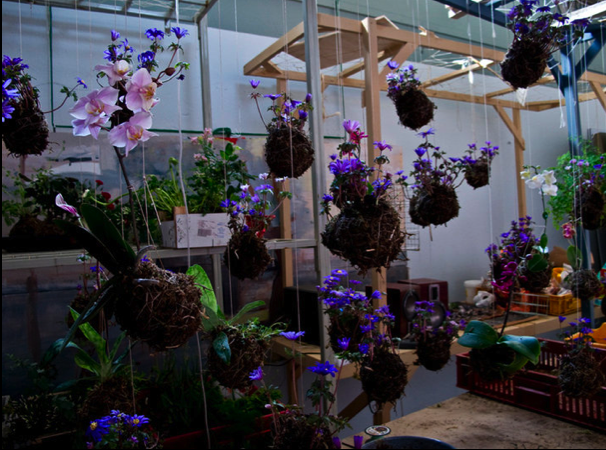 The dutch Fedor Van der Valk created an uncommon kind of hanging gardens. 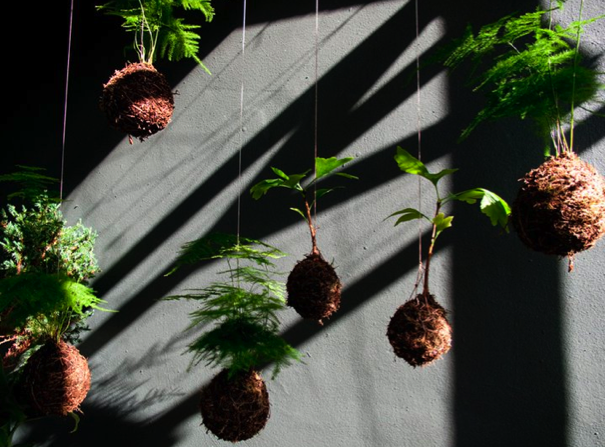 The project, named String_garden, consists in growing out from a ball of soil or moss any kind of plant, from small trees to strawberries, from simple grass to colorful flowers. These balls are hanged with strings to the ceiling – if indoor – or to other platforms. They are a redesign of the original japanese botanical style called Kokedama. Even though we don’t know if the author of these “installations” is an artist, a gardener, or none of them, we think that the beauty of these images speaks by itself. In our times, to receive a letter – I mean the one hand written – is an outdated and rare event. The japanese design studio eding:post and the botanical shop neo-green collaborated to try to bring back people to this practice and, at the same time, closer with nature. 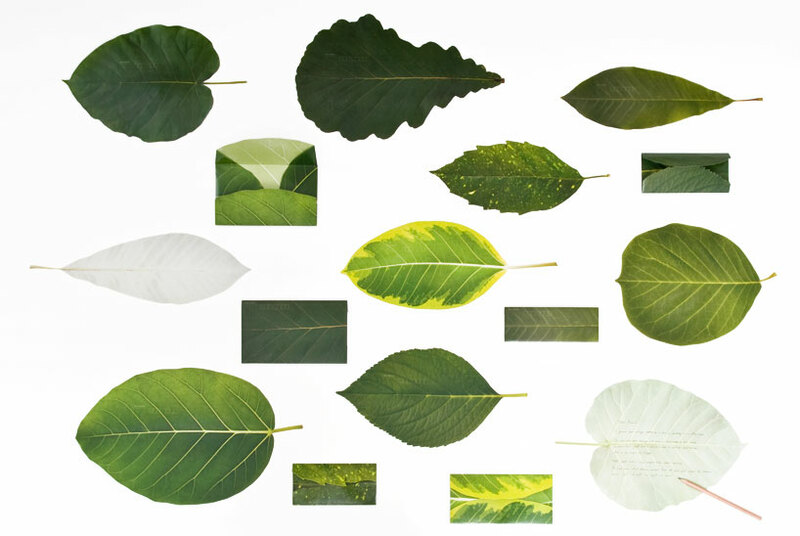 They created the leaf letter, a leaf-shaped postcard. This idea was born from the old japanese postcard: in fact, the term “hagaki”, letter, is said to find its origin in the world “ha”, leaf. 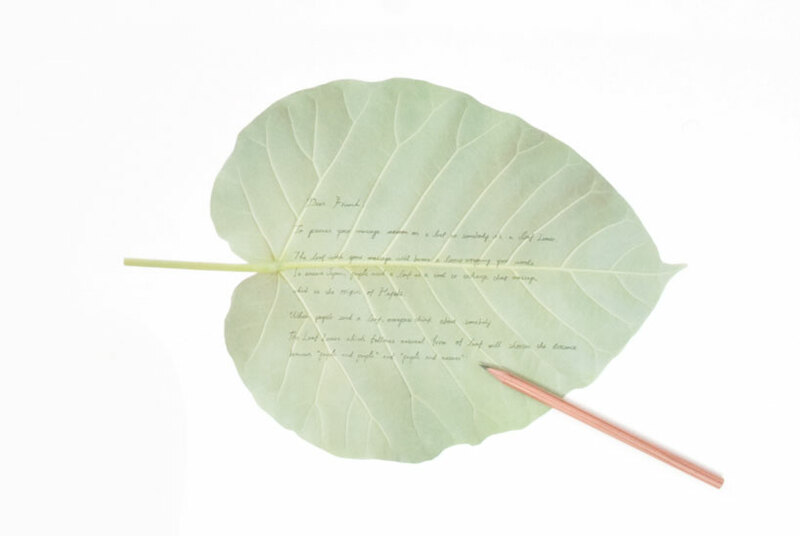 Indeed, in ancient Japan people use to get leaves as paper and send their messages folding the leaf as a letter. Neo-green and eding:post have brought the old hagaki practice in our times, turning it into a modern and original writing paper. To set down our thoughts on leaves seems indeed less cold than writing them on a screen, so, next time, even if delivering times are going to be longer, we want to give nature a chance. What would you do with tape? What would McGyver do with tape? Probably he would save the world from a disaster. 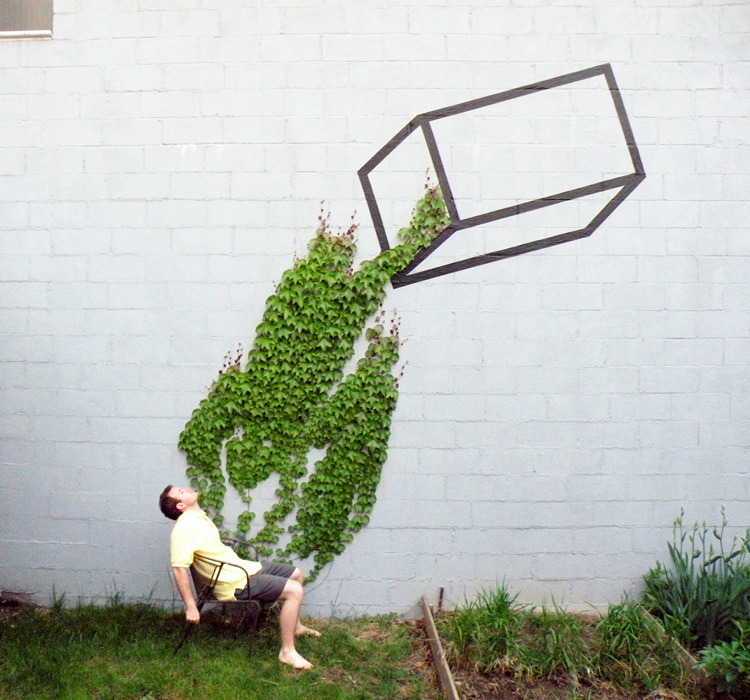 Instead, New York based artist Aakash Nihalani makes it his paintbrush to draw on the street. Using tape he builds geometric shapes, mainly isometric rectangles and squares, in order to show us the hidden geometry of the city, and of course to give it a touch of color and surprise. 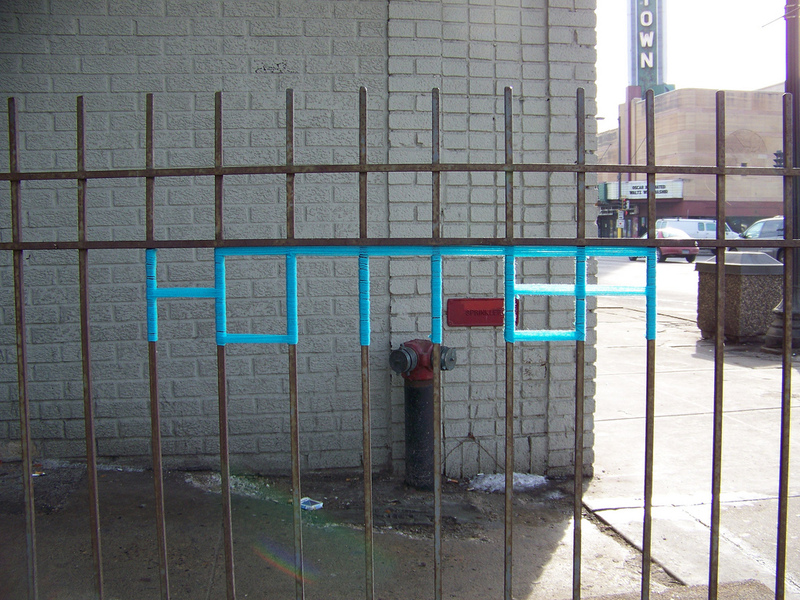 His illusionistic, fluorescent drawings pop up from walls, sidewalks and windows, crawling upon the city’s structures and shapes, playing with any scenario which got chosen. 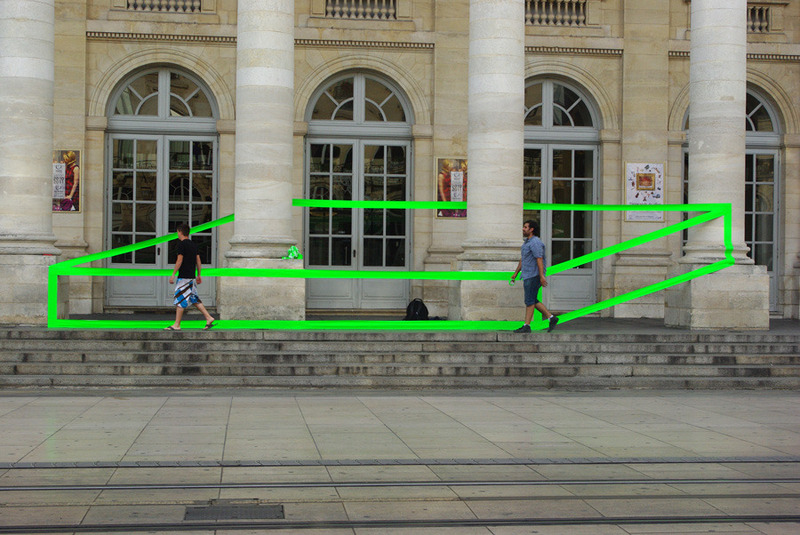 The great interaction between tape and its framework doesn’t end up within the city corners, involving people as well in the role of actors and part of the whole composition. 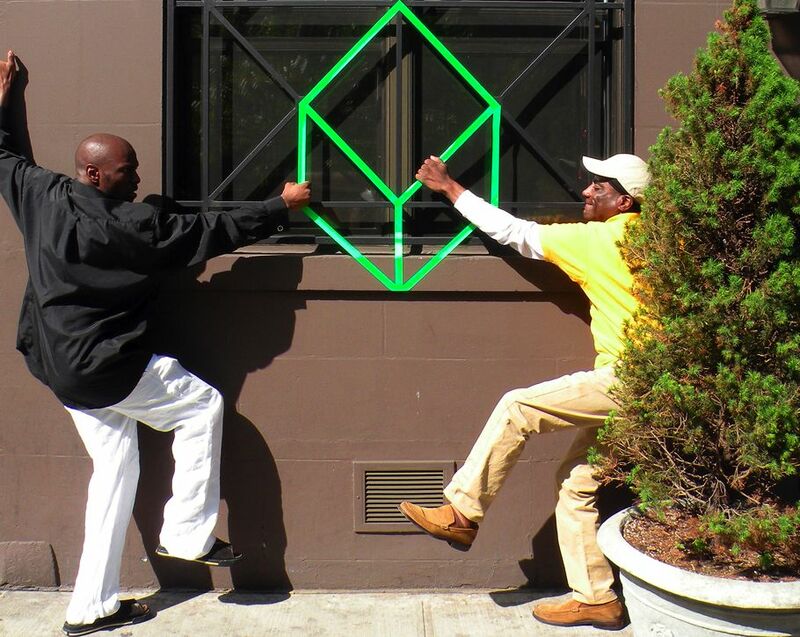 Finding one of these installations is a face to face with the hacked side of the city, the one where street artists play and urban actors, like Aakash Nihalani, show us their truth, and that is probably why he points out that “people need to understand that how it is isn’t how it has to be”. He explains his work in this video, have a look!